George Roger’s Clark was an American Hero during the revolutionary war. He didn’t fight with Washington on the East coast. He pushed the war to the western parts of the US including Indiana. This is an image of his memorial in Vincennes Indiana. It is one of those things you read about but don’t connect. The reality of war. George Roger’s Clark managed to wrestle Vincennes away from a significantly larger British force. He marched his men in a circle so the force appeared significantly larger than it was and the British surrendered. Vincennes is a city that time forgot. It was once one of the most important commerce cities in the state of Indiana. Then it slowly faded from glory. 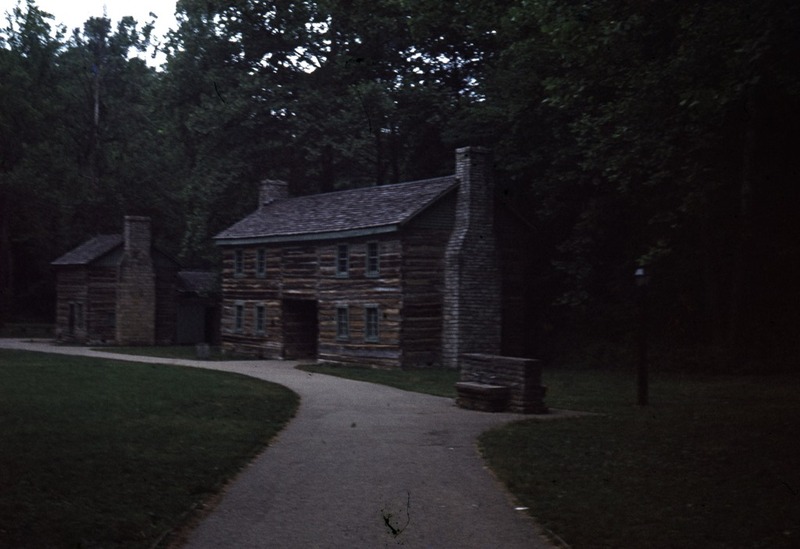 The first capital of Indiana was Corydon, but the territorial governor of the western US lived in Vincennes. George Roger’s Clark won the city back from the British using his own money to fuel the revolution. Sadly the US government was never able to pay him back and we ended up bankrupt. 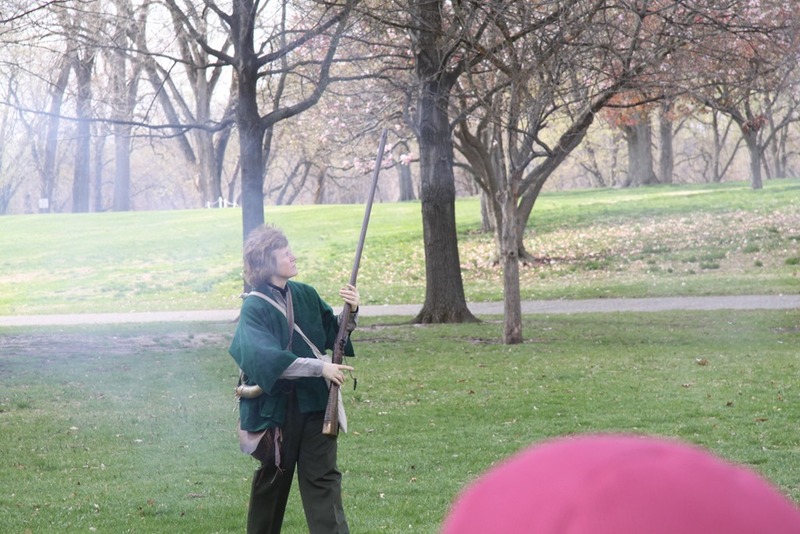 The historical character here demonstrating the loading and firing of a revolutionary era musket. Now, during her talk she mentioned that she was not a high speed musket loader. She explained the process and then fire the weapon. For safety she fired the weapon away from the crowd of on lookers. Vincennes is nestled on the banks of the Wabash River. The Wabash forms the border between Indiana and Illinois for the southern part of the state. 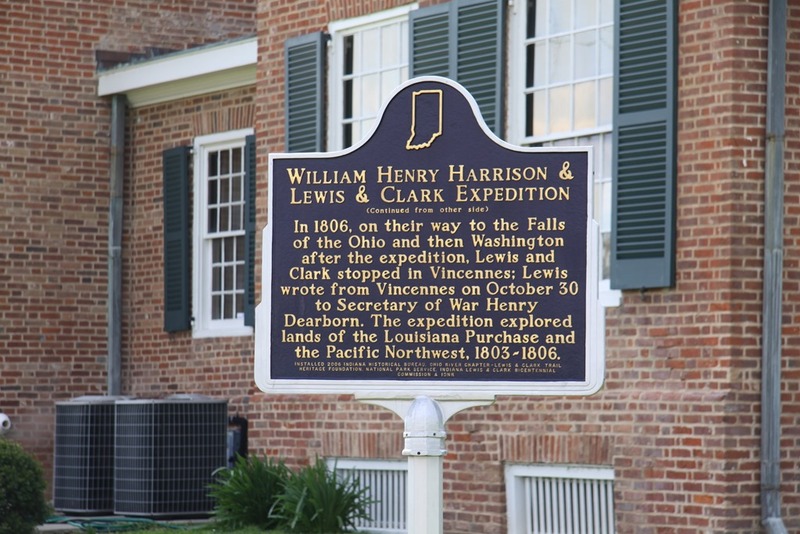 Vincennes is one of the oldest cities in the state founded by French Fur Traders in 1732. It lies on a map between Terre Haute and Evansville Indiana. Although on a size scale it is significantly smaller than either. Its population has risen over the past few years now reaching about 19,000 people. 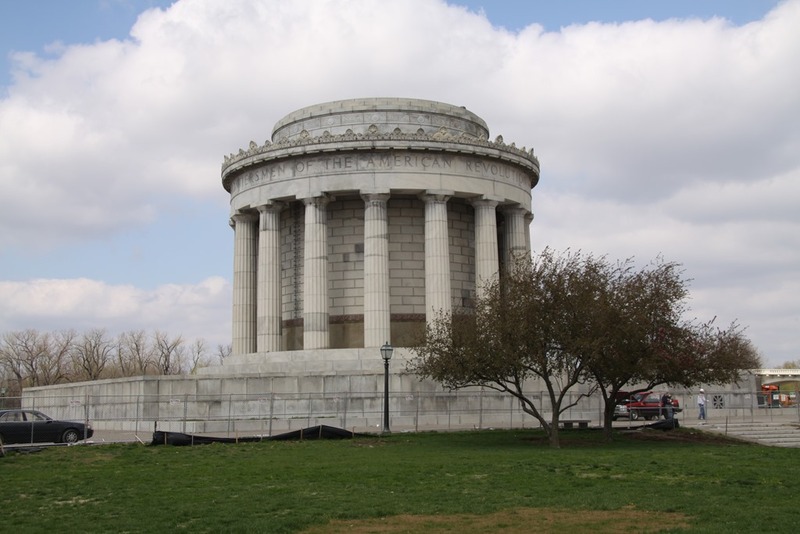 It has a wonderful historical park that is dedicated to the heroes and past of Indiana. There is also the Territorial Governors mansion that has many interesting things to see. It was a house built at the time when Illinois was the furthest West and Indiana was capital of the Northwest Territories. Yes, like my father and grandfather I like to take pictures of the historical markers. I do not, however, slam on the brakes while driving and pull over making everyone in the car read the historical market. The image is an homage to my father and his father. Continuing their tradition of taking pictures of signs instead of the actual buildings represented by the signs! This in front of the former Governor’s Mansion of the Northwest Territories. Vincennes is a wonderful city to visit. It represents the past of Indiana in a manner that is impressive and fun. It isn’t the easiest place to get to now, when we use cars instead of rivers. I guess if you were floating down the Wabash River it would be pretty easy to stop there. It was in 1775 the site of a major British Fort The the remains of which are still there) and the hub of the fur trading in that part of the country when fur trading was huge. We had a blast wandering the city and the museums. It is always fun to connect with the past. Will I be ever free? and will always be in the line. First off congratulations to the Indiana Hoosiers Football Team 4-0 for the first time since 1990. My dad would be really happy right now. He loved IU Football and Basketball. There is something to be said for mowing in comfort. 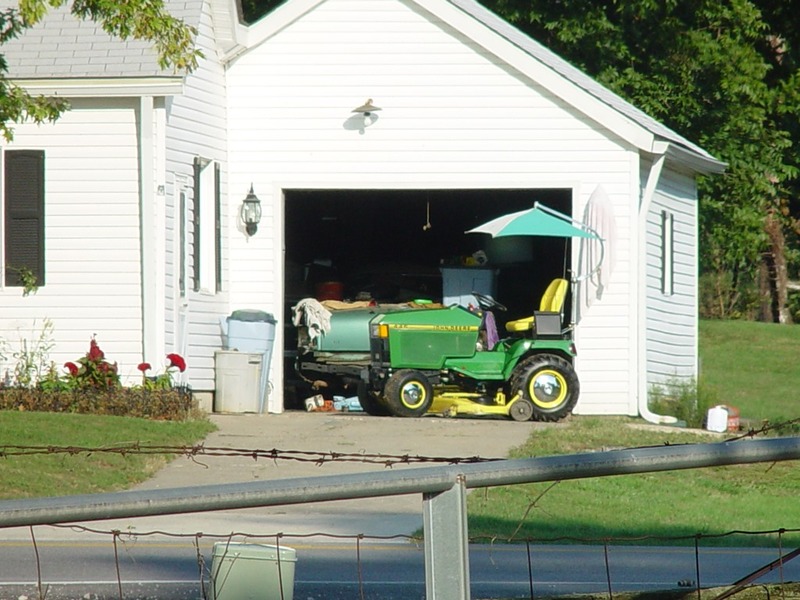 There is also nothing like a John Deere green mower or tractor. In the ‘burbs you don’t see many riding mowers. I think if we had one we could get it in gear and then have to rapidly turn to avoid the end of our yard. But when we lived in Indiana we had over a 1/2 acre and I loved mowing the yard on my tractor. It was relaxing. Mowing with the push mower down by the pond was not relaxing. But that is a different problem. That was trying as much to avoid the occasional Natrix Americanus as anything. 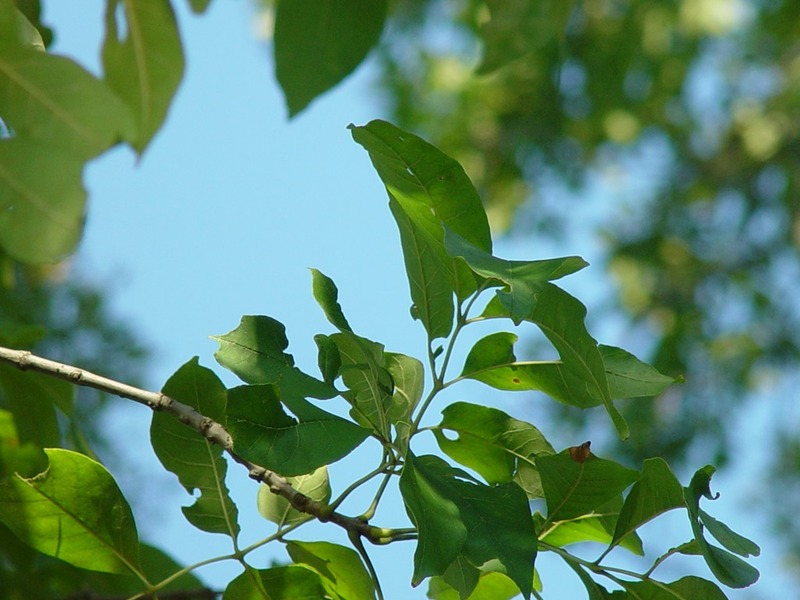 This particular image came from an Apple Orchard trip in 2003, somewhere between Indianapolis and Richmond Indiana. Yes I learned photography from my father. Who, I found out during the Family History scanning project (this is the family history blogging project now) that in fact my father had learned from his sister Barbara who was and award winning photographer. I love taking odd pictures. Looking at the world through different eyes. This the sky above the apple tree. I suspect I should talk to Sandler Boggs about that, possibly he hears a poem in the rustling of the leaves and the view of the world from downside up. The apple orchard had a petting zoo and a little pond you could walk around and then go pick your own apples. I can hear my grandpa Ray in the back of my head – why are you paying to pick apple’s for the farmer, you pay the same amount for picking apples as you do for already picked apples. 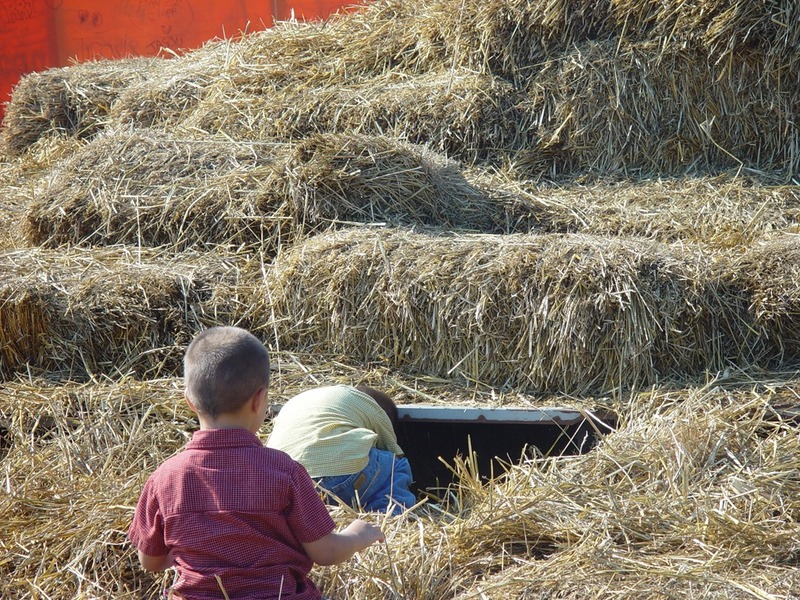 They had a corn maze (it is after all in Indiana) and a hay bale tunnel and fort. I think those are ubiquitous through Indiana apple orchards. I don’t remember but I probably played on them at this age as well. Going to Melton’s (in Bloomington) was a big deal. Dad would always let us get lot’s of apples and my personal favorite apple butter. I have always liked Apple Butter for some reason. It just tastes better than Jelly or Jam. I guess I am like my father an Apple lover! This image of the creek that runs through Springmill State Park in Southern Indiana. Springmill was a restored pioneer town and a working well working most of the time water mill. 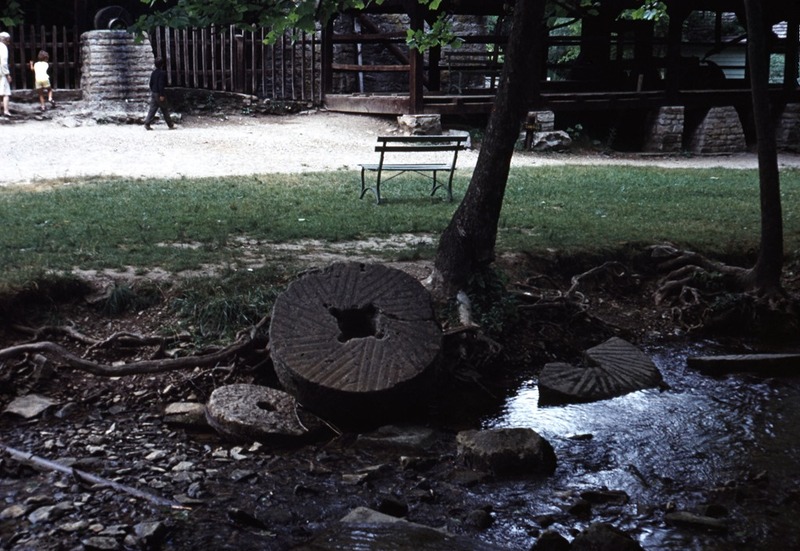 There aren’t many places that make grinding stones so when the grinding stones cracked they didn’t operate the mill until a new one could be made. The goal was to recreate life in Indiana in the 1830’s. My dad took this picture in the late 1960’s. The funny thing is if you went today it pretty much looks just like this, roughly 40 years later. If you had a time machine and went back to the 1840’s the bridge wouldn’t be there but everything else would be the same. Dad was always interested in the history of where we were. I remember him coming to a screeching halt by the side of the road to read an historical market. He and my grandfather Andersen took any number of pictures of the various historical markers they encountered. Everywhere we went as a family we always found something of historical or learning interest. I find myself doing the same thing to my family. I have talked many times about the wonderful picture dad took. 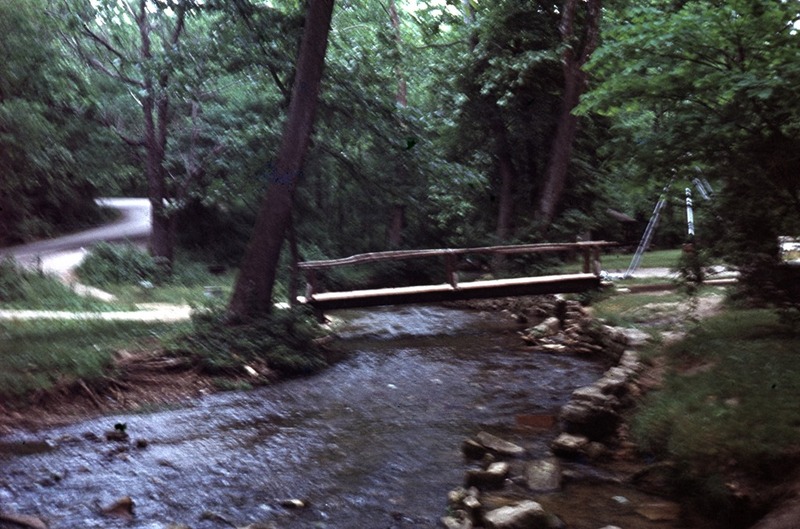 This still of Springmill State Park, we went there a few times over the years. What I haven’t done in the year plus since dad died is talk about the man. Not the father or the person I grew up with but the person that touched other people. The teacher, the professor and the man. My dad was never a tall person. He stood 5”9” until the day the doctor measured me at 5”9” and I was taller than eh was. Then he moved slowly down to the 5”8” he really was. He told people he was 27 years old. If you walked along the street and he passed you and you stopped him and said how are you? He would always answer I am incredible. If he asked you and you said good, he would say I am incredible. My dad was very liberal. Not communist died in the wool destroy the country but liberal. He believed in equality for all. Men, woman, race, creed or orientation. He was a staunch defender of the little guy. We had a family friend whose husband left her with two kids. Whenever we were together dad acted like dad for them as well. He was just that way. I remember watching sporting events with dad, and if IU wasn’t playing dad would always root for the underdog. Now if IU were playing you darn well better be quiet and listen. Oh yeah and in our house we rooted for IU. Dad sometimes had to work on Saturday mornings, as did mom. When Lynne and I were old enough to be responsible for lunch we made lunch for dad. No matter what was on the TV when dad got home he would seize control by invoking the educational TV rule. Educational TV included virtually anything dad wanted to watch including wresting. I would argue (and lose) saying wrestling was not educational TV. One time he wanted to watch Wrestling, I was actually watching a National Geographic special, he said Wrestling was more educational. I lost. Dad always expected a lot of his children. I guess because he grew up a cobblers son, the whole shoe thing applied. Dad expected us to be in love with the acquisition of knowledge and the act of learning. I can say I still am. I love to learn new things. Because of my father. In August and September we would wander down to mom and dad’s house for family events. Without fail we would take home the most amazing tomatoes and peppers and other things dad had grown. But he didn’t just give those to family. Everyone he knew or met got tomatoes, peppers and whatever else he was growing. From the time I was 8 years old he played with growing various fruit trees. As I pour though the thousands of slides and pictures dad took I miss him less now than I did. I can always see his view on the world by looking at the pictures he took. Dad is here in these words. He taught me to sit and write at a typewriter, to be creative. Dad taught me to love books, love reading and most of all love him. Iaf you asked my dad a question you would get one of two answers. He would ask you to think about what you were asking and see if you could figure out the answer or your own, the teacher. Or the smart aleck response. You could never tell what was coming next. Thanks dad, I probably never told you enough how much you meant to me.